The Minority Leader of The National Democratic Congress (NDC) in Parliament, Hon Alban Bagbin has dared President Kufour to deny that the US$300 MILLION loan facility being contracted by the Ghana Government from the China New Technic and Construction Investment (CNTCI) is not a scam. Talking to The Crusading Guide in an interview, Hon Bagbin said initially the President did not know that the loan agreement was a scam but upon personal investigations, he had realised that the agreement would never go through. Asked if he was sure of what he was saying, the Minority Leader dared the President to deny he (Bagbin's) assertion and he will produce evidence to that effect. “I say His Excellency the President is aware that the loan agreement is a scam. 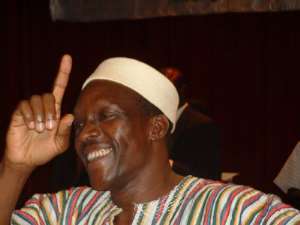 If he denies it, I will produce the evidence”, Bagbin declared. Hon Bagbin said he knew the President was an honourable man who would not tell lies. Asked why he will not put the evidence of the loan being a scam in the public domain, Hon Bagbin said “You confront him (the President), if he says what I am saying is not true then I will be compelled to prove it”. “But if you go and ask him and he says 'Oh my brother, it is true', I will have nothing more to say”, he added. Hon Bagbin said he had disclosed to NDC supporters in Takoradi that the President was fully aware that the loan was a scam, after utilizing his recent one week leave to conduct his own investigations in London. The Minority Leader told the NDC faithfuls that the recent address on the loan issue by the Finance and Economic Planning Minister, Mr Yaw Osafo Maafo to the press was “a make up”. He said the address of the CNTCI office in London as was given by Mr Osafo Maafo – as Suit 3/A 24 Marlow House London. W26HJ UK – was non-existent. According to him, he found this out after an exhaustive search during his recent visit to London. The closest he could come to, according to Hon. Bagbin, was a Flat 24 Marlow House that was said to be occupied by Sudanese refugees.